This scripture is often read to mean that Jesus expounded doctrine directly, rather than citing repeatedly what others had taught before (see some detailed discussion here). As Ellicott puts it, “It is the prophet, or rather, perhaps, the king, who speaks, and not the scribe.” This scripture led me to wonder how leaders in the modern Church refer to different types of authority in their teaching. Scriptures: This includes only the four canonical books of LDS scripture. High LDS Authority: This includes General Conference talks (by General Authorities or auxiliaries), other recorded talks or Ensign articles by General Authorities or auxiliaries, books by General Authorities, unrecorded quotes from General Authorities (e.g., “President Boyd K. Packer surprised me with this puzzling question”), and non-canonical resources that are often regarded as authoritative, like the Church Handbook, the Bible Dictionary, or the Proclamation on the Family. Medium LDS Authority: This includes books by LDS people who are not General Authorities (e.g., Harriet Uchtdorf’s book The Light We Share) and unrecorded quotes from members of the Church (e.g., “a sister missionary said this”, or “my wife told me”). No LDS Authority: This includes quotes from books and news articles by non-LDS authors (or at least, authors who I have no reason to believe are LDS), as well as unrecorded quotes from non-LDS individuals (e.g., “the man from the federal disaster agency said”). I stuck with simple counts: how many times are verses of scripture quoted? How many times are General Conference talks quoted? If you quote 1 Nephi 1:1 twice in your talk, you get two “points” for it. Likewise, for simplicity, I stuck only with quotes. So if a speaker recounts a scripture story without quoting any of it, then that wouldn’t be counted. First, how common are each of these forms of authority? 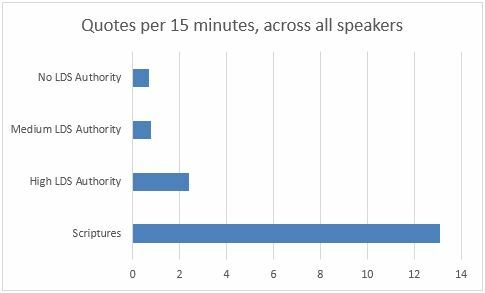 The figure below shows how often we’d get a quote per 15 minutes of talk. The average talk length is 13 minutes, ranging from 3 minutes (for President Monson’s “Until We Meet Again”) to 20 minutes (President Uchtdorf’s “Living the Gospel Joyful”). Scriptures are cited often (almost one per minute). All other forms of authority are much less frequent, with High LDS Authority quotes about twice (on average), and other levels of authority much less often. Now to the question at hand: Do leaders in different positions rely more or less on authority? They do. If we compare those who are sustained as prophets, seers, and revelators (i.e., the First Presidency and the Quorum of the Twelve Apostles) to all other speakers, we see that the prophets are much less likely to quote high authority sources or medium authority sources, as in the figure below. The prophets, seers, and revelators are in blue. The other speakers (Seventies, Auxiliary leaders, Presiding Bishopric) are in either red or gray. Note that the differences in red are those that we can be relatively confident (95%) are not just random noise. Even though it seems like prophets are likely to quote the scriptures less often, there is just so much variation that we can’t be confident that the difference isn’t just noise in the data. It’s interesting to note just how much variation these averages mask. If you look at the table below, you’ll see that although the averages are different (which is what we saw in the figure above), the ranges are almost identical. There are prophets quoting scripture more than 30 times (per 15 minutes! ), and there are other speakers doing the same thing (compare Elder Hales of the Twelve and Elder Robbins of the Presidency of the Seventy). 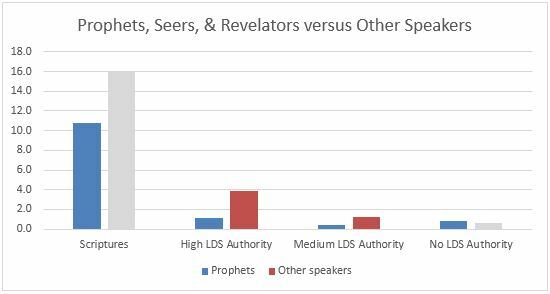 Likewise, there are prophets quoting high authority sources more than 8 times, and there are other speakers doing the same (compare Elder Ballard of the Twelve and President Burton of the Relief Society). So speakers aren’t uniformly adhering to some unwritten rule. But on average, it certainly does seems like, just as Mark and Matthew reported was true for the Savior, our prophets are much less likely to refer to earlier authority in their teaching. Elder Ballard, interestingly, quotes previous talks from himself at length. In this conference, he’s the only one to do that. Thirty-one previous General Conference talks are referred to over the course of the conference. The only talk to be mentioned by two speakers is Elder Oaks’s “Good, Better, Best” talk from 2007. If you drop President Monson’s welcome and farewell talks, then the High Authority result remains statistically robust (99% confidence), and the Medium Authority result drops just a little (to 93% confidence). Conventions on levels of confidence vary across fields of study. I played with disaggregation of the authority categories some and the patterns seem consistent. Caveats: Of course, this is just one General Conference. And I believe the right (but much more time consuming) way to do this would be to count the words of scripture and other citations, since quoting five verses in full is very different from quoting a line from a single verse five times. So, that’s something to look forward to once I retire from my day job. Addendum: Someone asked about the medians and standard deviations (i.e., are these results driven by outliers). While the regressions take the standard deviations into account, I constructed a bonus table with the medians and standard deviations (all calculated in Stata). As you can see, the High Authority results are more stark (if anything), the Medium Authority results look about the same. The scripture difference is smaller, but that wasn’t statistically significant in the main regressions anyway, so that’s consistent with what was reported above. An interesting analysis, though I never read that to mean referring to other authority, but to mean teaching with the power of the Spirit rather than relying on intellectual interpretation. Wow, cool analysis. Thanks for sharing. With so few data points, a single outlier can skew means and ranges very quickly. I’d be curious to see the medians and standard deviations. Post the spreadsheet and I can calculate them for you in a couple minutes if you like. Very interesting, Dave. In addition to the other reasons I look forward to the next GC, I look forward to seeing your next analysis. Goodness, if you can do this sort of analysis with your day job, you’re doing better than me. Except, I know what your day job is, which means I know that’s not true. Puzzled. Good point, Adano. I’ve put up the medians and standard deviations, together with my interpretation. Ha! I thought there might be a separate category for how often C.S. Lewis is quoted. I love your analyses here, David. Great stuff! Your major finding is intriguing. As you’ve already suggested, it brings up so many other interesting questions that could be pursued (if there were more time). One I wonder about is if there are reliable differences among speakers across time. Like if President Monson quotes “the poet” this Conference, was he more likely to last Conference too? I would guess that there are such differences, but I haven’t studied it. Or another question that might add support for your major finding if it held up is if people quote less authoritative sources more as they rise in the hierarchy. You could compare what sources men like Elder Ballard and President Uchtdorf quoted when they were Seventies to the sources they quote now, for example. Or it might even hold across the change from being in the Quorum of the Twelve to the First Presidency, or to becoming Church President. Thanks again for this really interesting analysis. This is only tangentially related, but I wrote a post recently where I looked at which books of scripture FP/Q12 members quote when they quote scriptures. So I’m loving seeing more of this type of analysis done! Ziff, thanks so much for pointing me to your interesting analysis of books of scripture in Conference. I was wondering if anyone else was doing this kind of analysis, and now I know the answer! That’s interesting work and I look forward to continuing to read about it. Jones, perhaps amazingly, C.S, Lewis made only a single appearance in this General Conference (Brother Robbins’s talk, Which Way Do You Face?, quotes the Screwtape Letters.) Maybe we’ll see a resurgence in a month! Hmmm. I dig the scriptural angle…but what were the scriptures? Were they quoting Christ and using Christ’s words? Not confrontational but curious.